Discussion in 'General discussion' started by AliK, Apr 17, 2018. Some of you may know I regularly get insomnia and was tempted to head into the garage to work on engine for a couple of hours but instead forced myself to stay inside and do paper work - which soon turned to unnecessary eBay generic surfing looking at parts I don't need. I bet none of you ever do that! Can we give you shopping lists so you can search for the hard to find things we need? Im after a Skyline BM44 master cylinder and servo or something similar for my Z. Cant find any at a sensible price though! Now that's a good idea - Ali's ebay-cavern - search 'n bids to order ! toopy, AliK and Russell like this. Oh add to the list an obscenely expensive water pump pulley @ £90 + shipping and taxes!!!! Why would anyone buy this!? Even without the import duties!?!?!? Tailgate seal - seems incredible value!! New Ignition barrel - good value!! Don!?!? The author was on breakfast TV (BBC1) a while back and he made a lot of sense. Thanks Rob, that is great advice and look forward to seeing you on Sunday! Thought I recalled seeing it before! It would be good in an old Datsun Saloon. That's an R160, not an R180. Did I miss something on the listing or is it a case of knowing the year etc? 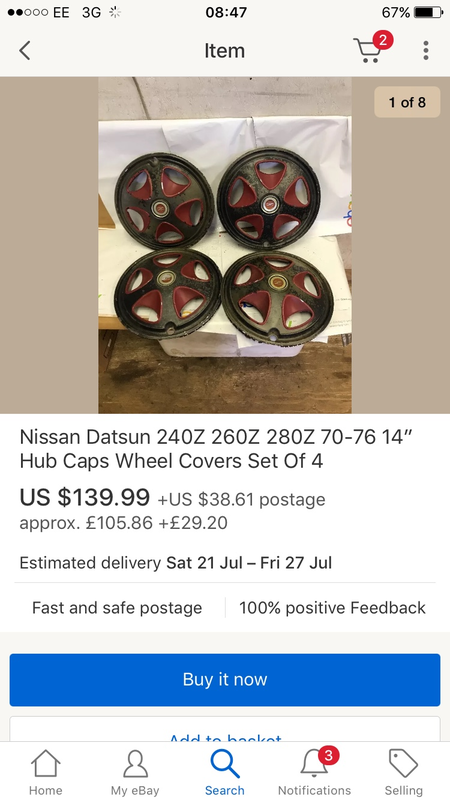 Anyone looking for hub caps? I am no expert but these appear to me to be an ok price? Need a bit of resto I think with some lacquer maybe?